In the following video a colleague of mine compares two methods for measuring varying or dynamic currents: using a current probe versus using seamless ranging. Seamless ranging is an Agilent only technology found in the N6781A and N6782A SMU modules. Seamless ranging technology allows the power source to measure the current flowing through it and transition from one current measurement range to another as the current varies. All with no glitches or discontinuities in the output power. It provides the user with a tremendous amount of dynamic current measurement range which can be useful when doing power and battery optimization measurements on devices that go through various standby (low current) and transmit (high current) cycles. The figure below shows a graphical representation of using seamless ranging to measure dynamic current. From the video we can see that although current probes are great tools for measuring high current they are a poor solution for measuring low level current and small current transitions. Seamless ranging on the other hand provides a very high resolution look at a varying current profile over a wide dynamic range. 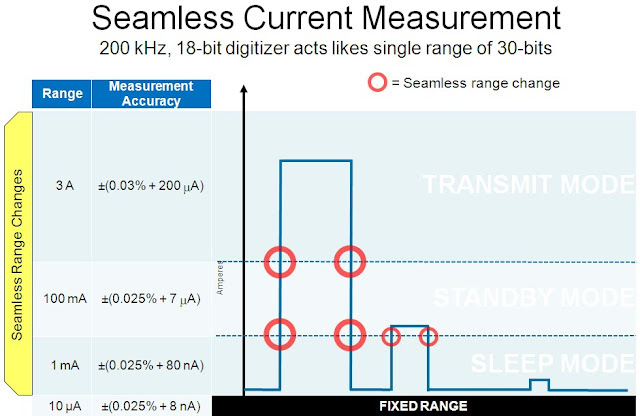 To see more of seamless ranging in action check out the YouTube video Agilent Battery Drain Demo: Seamless Measurement Ranging on the N6781A. If you have anything to add to this post please use the comments section below and if you have any questions feel free to email me. Well written your articles have inspires me a lot of- really gives me an insight on this topic.Here you can find more great information if you have time please visit emi testing lab. Nice blog and nice post.Thanks for sharing.keep updating.I suggest you the best business management consultancy ie SME.Have a look on SME Business Management Consultancy..SME provide services with the best solutions even in complex business situations as your finance is our concern. Thanks for sharining useful information.you can learn Best Inplant Training in Chennai | Python Training in Chennai. Really you shared the information is great and useful.I have learned new things.you also refer this ME Projects Chennai | Ns2 Projects in Chennai. Thanks for useful information.Embedded Projects Chennai | Final Year Iot Projects Chennai. Awesome Post!!! With unique content, I really get reading interest when I am following your article, I hope I ll help many of them who looking this pretty information. Network and Security Project Centers in Chennai | Big Data and Software Engineering Project Centers in Chennai | Robotics Projects in Chennai. Thanks for posting the blog!!!. The Inplant Training in Chennai being offered by DLK CDC will ensure 100% placement and wide industry exposure. This blog really very help full for all developers and students thank you for writing this blog and now Angularjs training development language more job opportunities available all development company's thank once. Excellent blog and nice blog post...Thanks for sharing.. Thanks for this valuable information with us.